Some watches are designed to make an impact on first sight, others can be more reserved, their details and intricacies to be appreciated over time as you study it in a quiet moment and contemplate the little mechanical wonder that makes the whole thing come to life. The Vault V1 aces both. "We almost didn't make it here!" Vault owner Mark Schwarz is grinning as he welcomes me, but he's not joking. Over the past few months he's found himself having to squeeze through a few tight chicanes and navigating his way through some unexpected obstacles as he raced towards a fast closing finish line, in his bid to have a finished watch to show on his kiosk at Baselworld 2018. Late drama and last minute plot twists have given him and co-owner Andreas Strehler a few sleepless nights, but they've done it, they're here with The Watch, it's all been worth it and today Mark Schwarz is beaming like a new dad. And rightly so, because when the idea of a mechanical watch which was based on the physical features of a strongroom lock and a vague philosophy of time personalised, began to consume his thoughts, Mark Schwarz was a policeman; serving the people but on a career hamster wheel, and particularly following a situation at work which made him contemplate the meaning of life, a world away from where his heart was telling him to go. Still, how does a policeman reinvent himself as co-owner of a cool, avant garde independent watch company? He saves his money, he studies and researches every spare minute, refining his ideas and transferring what only his mind can see onto the first rudimentary sketches as his concept takes a form. Then he persuades a modern day watchmaking legend to look at his drawings and agree to do a feasibility study, and crucially secures seed funding, and then when it appears that his stars have finally aligned, he takes his future in his hands and tenders his resignation to the Chief of Police. His fiancée has reservations about this off-beat departure, but to dare is to do, and with the quite spectacular Vault V1 I'm holding here today it's proof that sometimes, when something so powerful is driving you, then you have to let go of the handrail, push away and go freestyling. 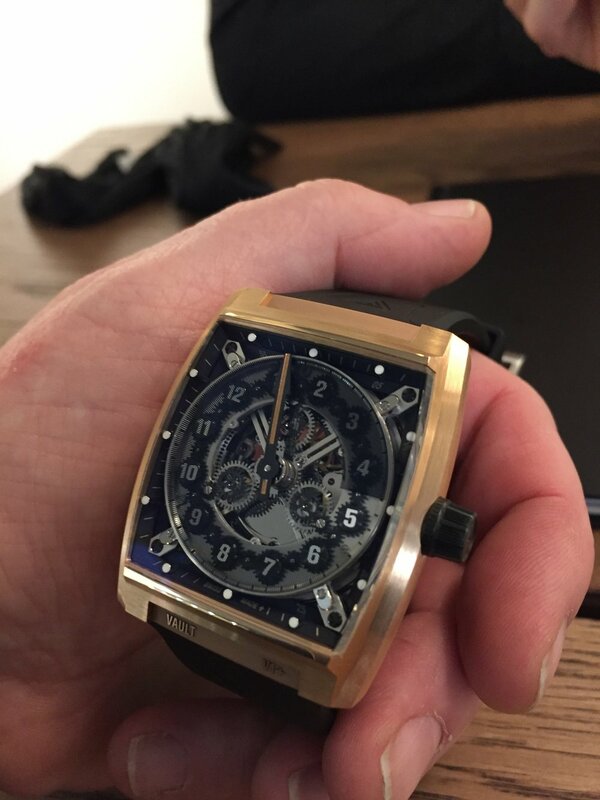 As with most new ventures, there's usually more than one way of going about it, and where it's far from uncommon for a budding watch brand to opt for an off-the-shelf movement, with some nice in-house finishing, but from the outset for the Vault V1, this was never going to be an option. What he had in mind was far from straightforward. In fact it would be unique and unprecedented. 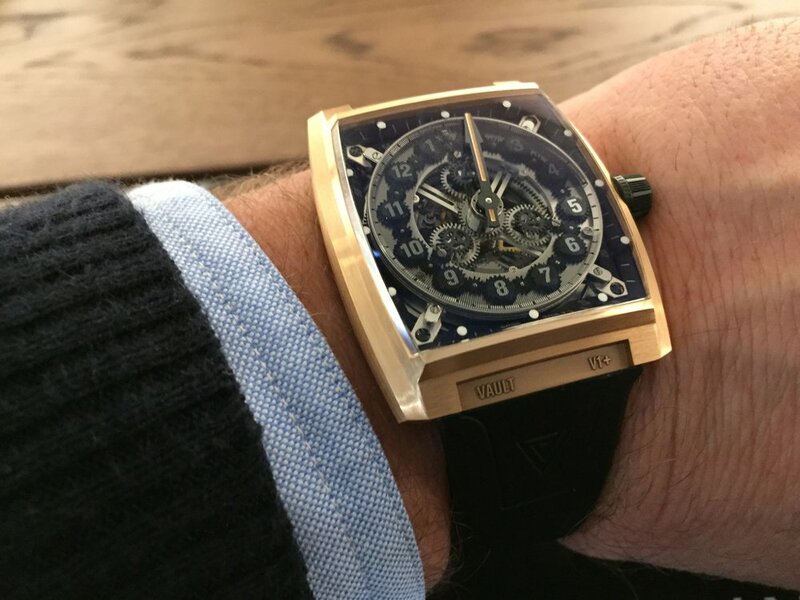 Fascinated by the idea of reflecting the uniqueness of time relevant to each individual person, while being themed around the technical aesthetics of a vault's locking mechanism, Schwarz knew that to get it off his drawing board to ticking on his wrist would require some serious horologic heavy lifting. He knew he needed to talk to Andreas Strehler. A master of profound ability in his own right, as owner of UhrTeil AG, Andreas Strehler oversees a crack team of watchmakers, specialising in horologic concept-to-reality movement development. For Schwarz, Strehler and UhrTeil was on a shortlist of one, and for the watchmaker, faced with this complex yet well thought out proposal which had materialised from this most unlikely direction, Strehler too became intrigued by the possibilities and the challenges Schwarz's brainchild posed. Andreas Strehler, holder of two Guinness World Records, likes a challenge. Requiring a radical rethinking of the fixed fundamentals of the time display, for over two years the intricacies of an extraordinary mechanical concept have been designed and developed at UhrTeil's facilities in Sirnach. And so here it is. The Vault V1 in person, and it is something else. A modern take on the tonneau shape gives the (W) 39mm x (L) 46.7mm stainless steel case of this black DLC version a highly contemporary appearance, with subtle curves with pointed corners and bevelled flat edges. 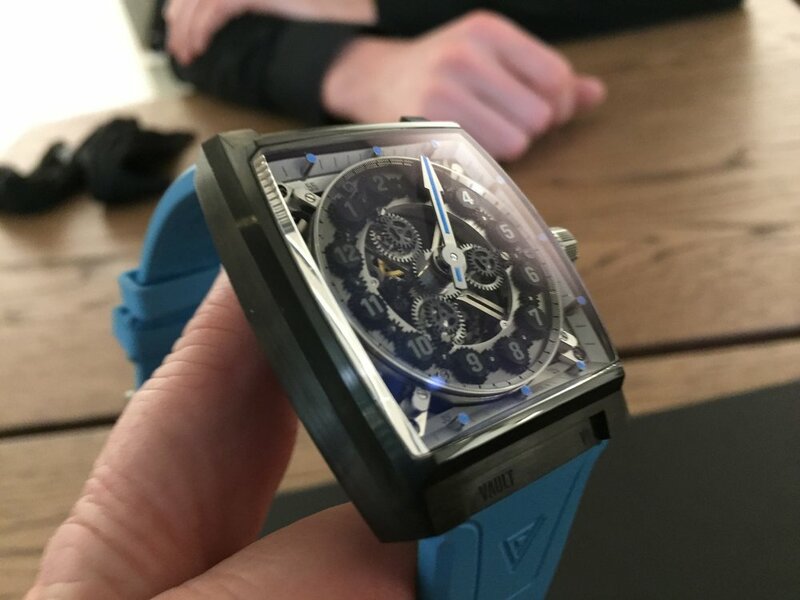 On top the box sided sapphire crystal opens onto a remarkable three dimensional industrious looking display of steely greys and black, accented with vivid blue detailing. Here a fascinating mechanical construction of toothed wheels, and a ring of seemingly out of place numbered cogs, dominate the dial area, which is surrounded by the twelve tiny luminous tipped cylinders of the five minute markers. Immediately you realise that you have to adjust your rules of engagement, as apart from the obvious minute hand and twelve luminous hour markers, everything else seems a little unfamiliar, weird even. What's going on? A lot more than meets the unexpectant eye. 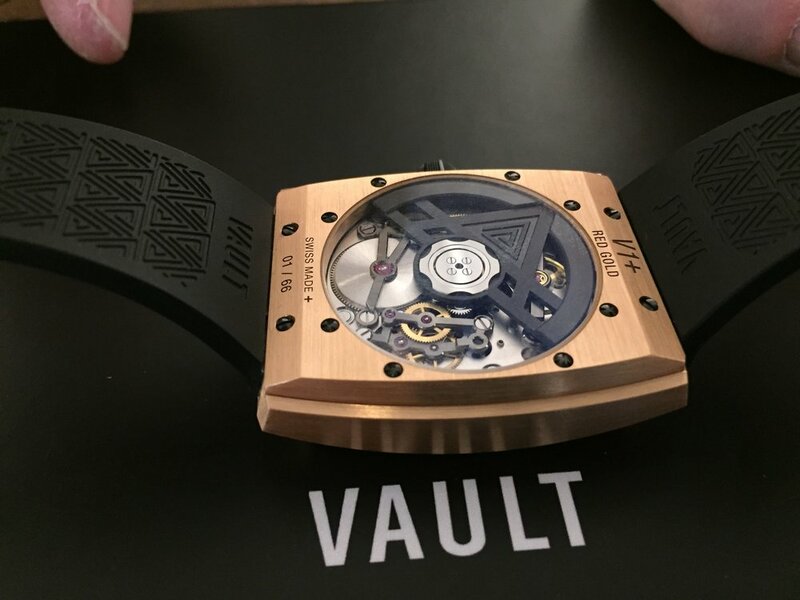 To understand, it might be best to look at its functions and unique features individually, because on so many levels the Vault V1 is the sum of all of its parts, a masterpiece of engineering, and while nothing moves quickly, there is movement going on everywhere. In fact you really need to play with the crown and fast forward the time to fully animate the mechanism, and that's when the sheer ingenuity, the complexity and the profoundly clever execution all sink in, as the penny drops and the V1 offers up its secrets. Keeping everything safely fixed into position, an X frame crosses the dial from corner to corner where each foot is securely seated with a screw. 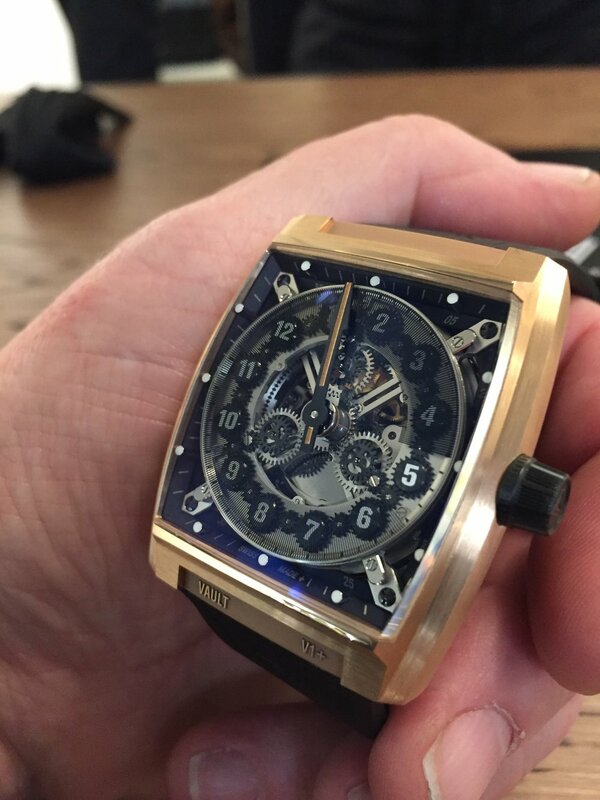 Around this, pretty much the only static element on the front of the V1, the mechanism is constructed, and above and below the frame everything is mobile, including even the self winding movement. UhrTeil's autonomous movement is held in place by a titanium mono-frame, and fixed only to the central cross section of the X chassis and the crown, so it is independent of the case, and what this highly unusual feature does is to enable the entire movement to rotate through 360°, along with the minute hand, when the crown is extended to adjust the time. With the crown pushed in, the minutes hand works in tandem with the sapphire disc which displays the hour, and the movement is locked so it does not move. 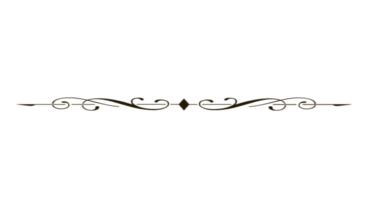 Between the crown and the chassis which traverses the face there's ample anchorage for the movement, so although not fixed down it's solidly held in place. And then there's that hour display. With ordered but strangely displaced numerals on a series of black cogs around the dial, at first look it seems as if it will demand some kind of IQ challenge to decipher how it actually works, and it is pretty unusual to the say the least. Driven by the tripartite elements of the central rotating gear assembly, the cogs of the Vault 'Hour Gear Transmission' are progressed around the rotating dial like the locking mechanism on a safe door, by turning the crown when it's extended to setting position, the tiny wheels between each pair ensuring they cannot spin off centre, and so the figures maintain in an upright position. Although all twelve can be seen, only one stands out at any time, as above the cogs, a sapphire crystal disc fades from clear (highlighting the current hour) to a graduating cloak of dark shade (lightest over the incoming, and darkest over the hour just past), and it too rotates in tandem with the minutes hand. If it sounds complex, that's because it is. However once understood it's intuitive and easy to get along with, as well as being unique. So much so that even with two or more identical pieces placed side by side and displaying the exact same time, each will appear different, because the 'live' hour might be anywhere on the dial. In this way, the V1 forms a bond with its owner as the time display is unique to each, and so the personalisation of precious time to the individual is captured in this somewhat bizarre, yet - once you can understand its language - a quite logical and beautiful way too. On the wrist it's certainly got fantastic presence, but it's not over the top and in fact is really cool and contemporary. It's pleasant to wear and always catching the eye, making it impossible to resist regular check ins, and I marvel at how quickly the eye and the brain can adjust to processing the universal perception of time in a new and fascinating solution. It's nearly time to hand it back and I should know better, but still the urge to pull out the crown and adjust the time once again, purely to indulge in that moment of private satisfaction and watching everything rotate and tumble at high speed, animating the Vault's safe door locking mechanism, is proving almost irresistible. Maybe just one more time. 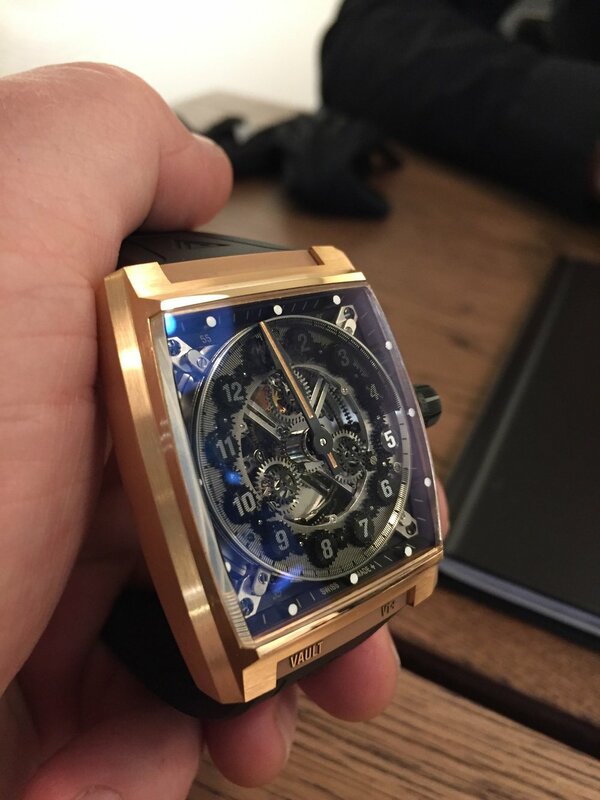 The V1 is being produced in stainless steel or titanium, and also in more exotic materials as the V1+ in a choice of rose, yellow or white gold along with platinum or carbon fibre options. 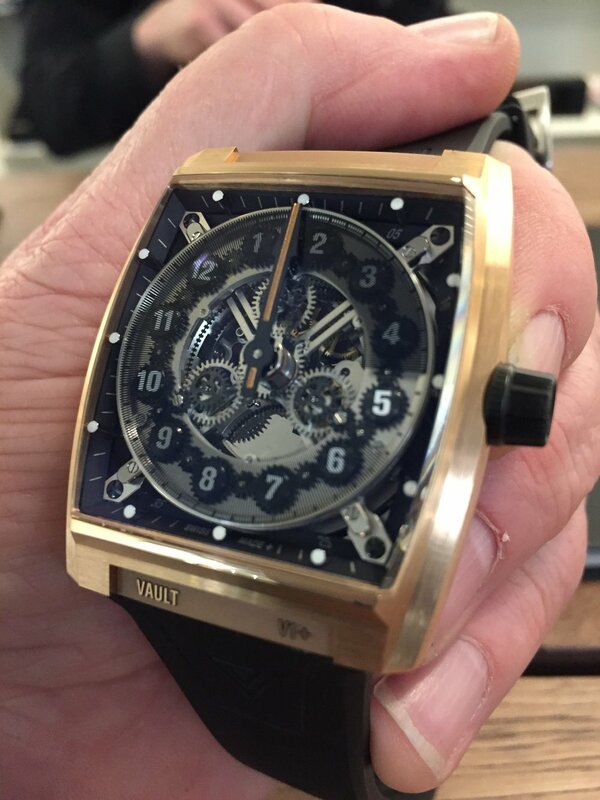 For Mark Schwarz Vault has been a journey of a million miles, because that's about as far away from a past life in a uniform he's travelled, to create a great watch where nothing is uniform and each moment is as individual as the person. It's been a road with many ups and unpredictable downs, but it's been worth it. Where a vault is for locking valuables away, this Vault is an expression of freedom, and the amiable young former policeman is soaring on new wings.